Gourd Handbags for December 2007 Craft show at Victoria Palms RV resort. 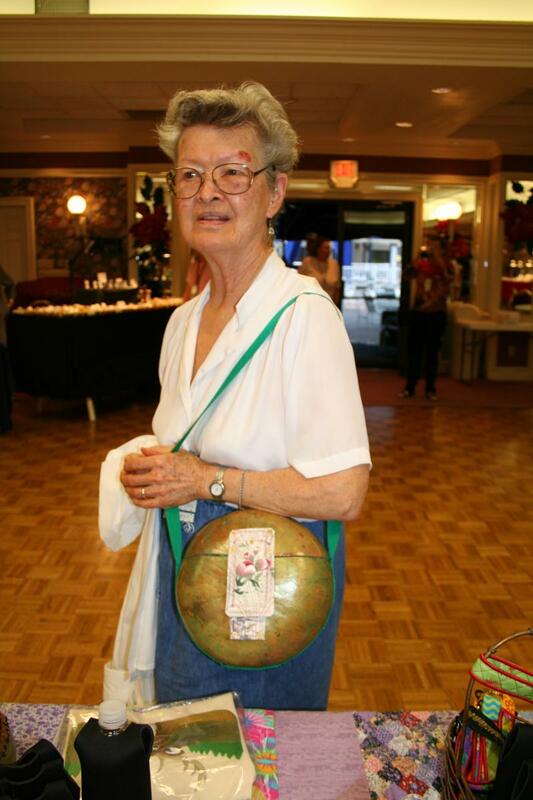 Mint Canteen Gourd Handbag goes home with the lady in the photo. This canteen gourd bag is a smaller size in a green metalic tone with fabric velcroe closure and zipper pocket on the inside. Hinge on back with the velcroe for easy access to the inside. 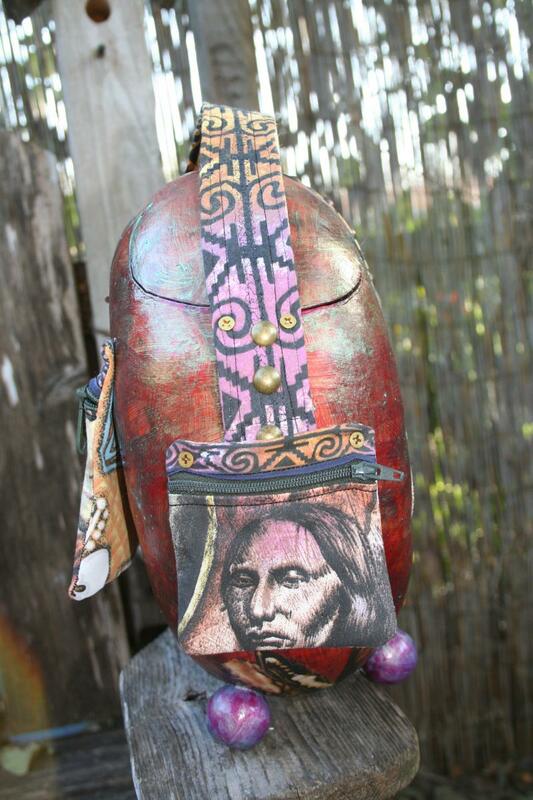 The fabric on this one is a floral with some of the greens of the webbing strap and metalic glaze on the gourd. Didn't get to have photos of inside as it was purchased before I got more photos. 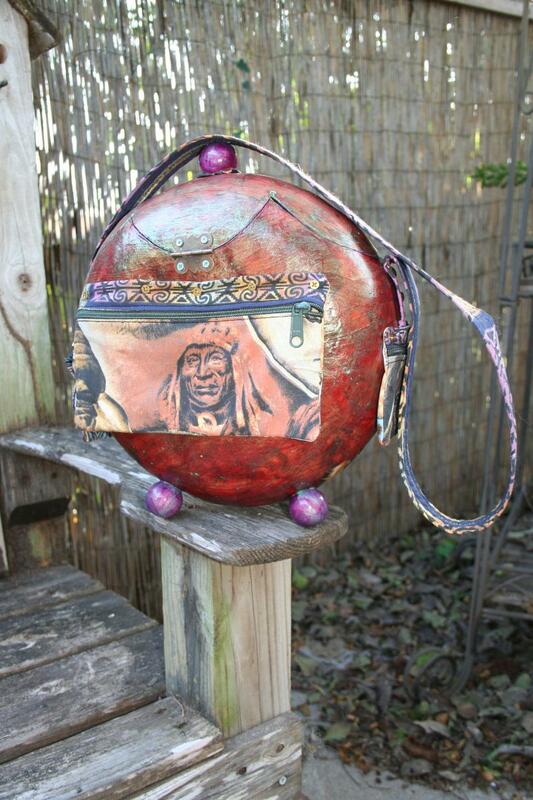 Below: More views of American Indian medium bag with feet and top round balls. 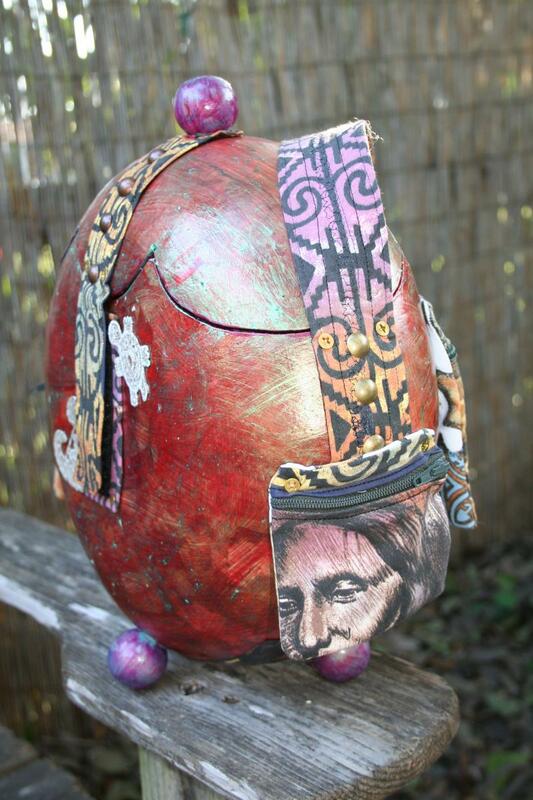 The Inside is fabric adheared to the inside of gourd, then an extra varnish on top of that. There is also a zippered pocket on the back side. 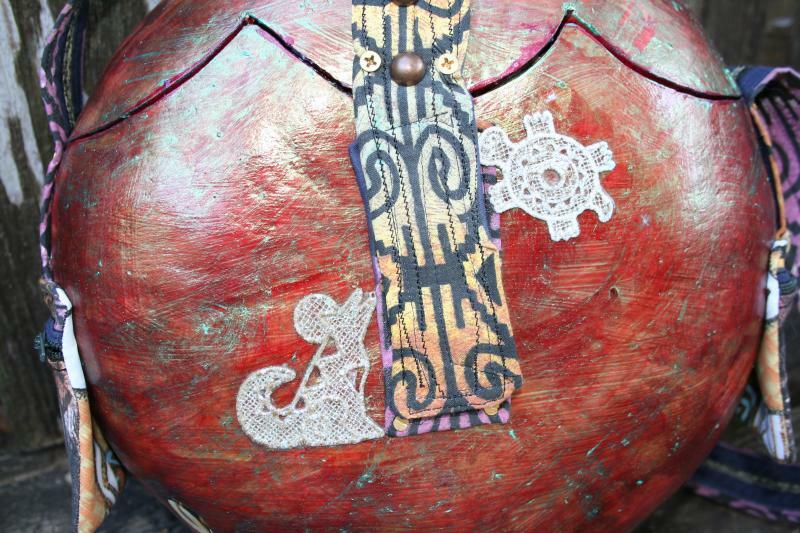 The zipper pockets are made on the Embroidery machine, then attached to the gourd with screws. After using my large canteen bag, I cound the just using tacks or upholstery tacks was not enough --- more secure with screws in addition or alone. Below: Medium Bag with knob feet and top knob. Native American Theme. Lace additions beside front velcroe closure. This gourd is 37" in circumfrence. 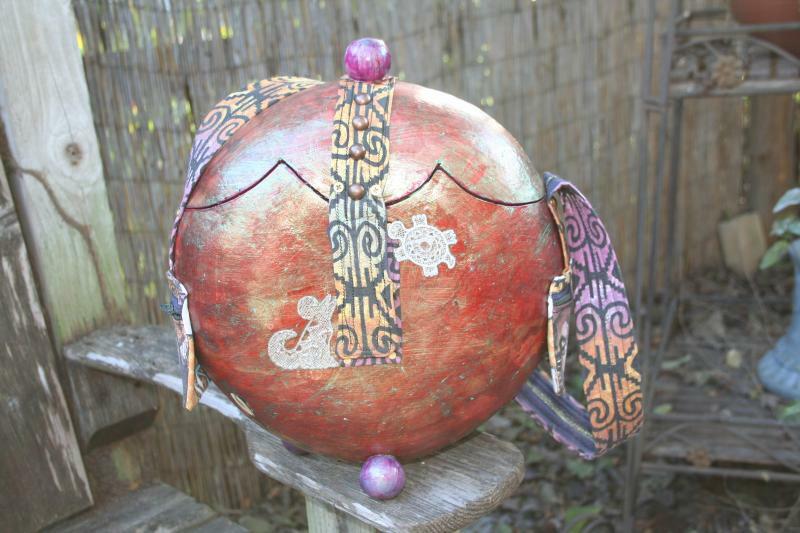 Added round feet and top allow this gourd bag tto stand on its ownand give it a character of its own. 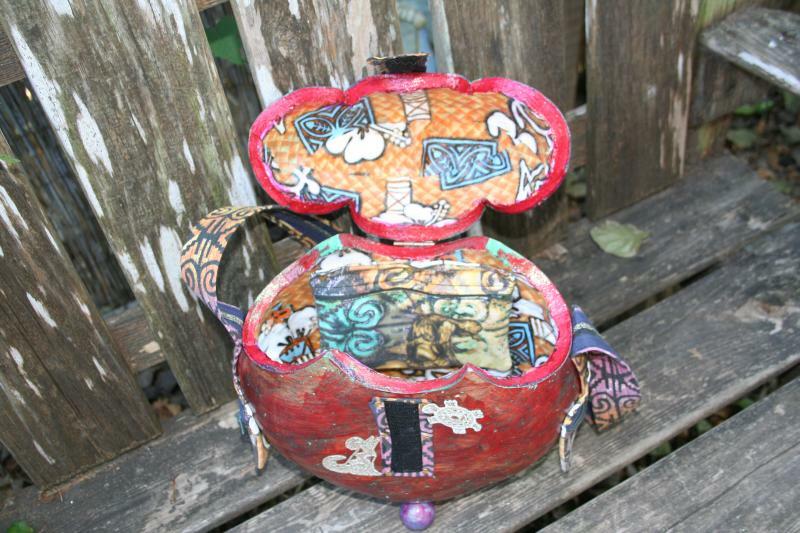 Several layers of color for the outer gourd and fabric interior with a zippered interior pocket. There are 3 exterior pockets,---one one each side and a larger pocket on the back.